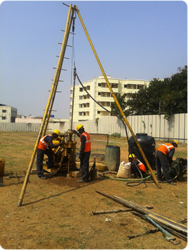 Our range of services include geo tech investigation services. Area / Size AS PER CLIENT REQUIREMENT . Service Duration BASED ON PROJECT . With Geotech Investigation we provide information on the physical properties of soil and rock around a site to design earthworks and foundations for proposed structures and for repair of distress to earthworks and structures caused by subsurface conditions.geotechnical investigations are also used to measure the thermal resistivity of soils or backfill materials required for underground transmission lines, oil and gas pipelines, radioactive waste disposal, and solar thermal storage facilities. Subsurface exploration usually involves soil sampling and laboratory tests of the soil samples retrieved.